Provides an independent supply of rainwater ideal for non-potable uses. JoJo’s Rainwater Harvesting Solution consists of a tank that accumulates water whenever it rains. It requires the installation of a pre-filtration solution, as well as suitable guttering and piping to transport the rainwater to the tank. Simple to install, its advantages include self-sufficiency and the convenience of not being dependent on regulated water resources. Lengths will vary depending on installation. 4a. From bottom of T-junction to slow release control valve (included in the First Flush Diverter). 4b. From side of T-junction to the elbow. 4c. From elbow through lid into the tank. To be purchased separately from dealer. An additional 40/20 reducer is then required to fit the tap onto the tank. This is an example of a basic Rainwater Harvesting System. Each installation will vary based on the setup and your personal preferences. Although rainwater systems are relatively maintenance-free, there are certain things that you should regularly undertake in order to prolong your system’s life, reduce the potential for damages and ensure you enjoy maximum benefits. Rooftops should be cleaned regularly to avoid contamination of the runoff. Dust, leaves, animal excrement and dead insects accumulate on the roof during dry weather. It is therefore important to ensure that the roof is cleaned before the rainy season starts, followed by a monthly check to keep it clean. See to it that branches overhanging the roof are regularly trimmed back. Ensure that gutters are free from leaves. It is a good idea to consider installing gutter mesh. Regularly check the pre-filtration device(s) to ensure that it is free from leaves and that rainwater is able pass through. If a First Flush Diverter is installed, check and clean it out on a monthly basis. Ensure that the diverter is dripping out sufficiently in order to reset the system. Inspect the inside of your tank every 3 months to make sure that leaf litter has not built up at the bottom of the tank. A properly designed system should not allow leaves and other material to enter the tank. Remember that water collected from your roof will not be clean. If you intend to use the rainwater for drinking purposes, consult an installer with experience in installing water filtration systems. For irrigation purposes, however, this water is ideal. 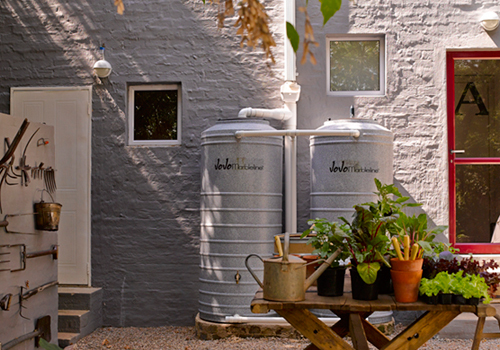 Calculate which size tank you require for rainwater harvesting. Note: The biggest downfall of rainwater harvesting is lack of storage capacity. Tank should preferably be placed at a downpipe, or alternatively be repositioned through the use of proper piping/guttering. Tanks must be installed on a sound, level and smooth surface. Level paving will suffice, or a properly designed tank stand. Alternatively, a plinth needs to be built, ideally with a concrete surface bed at least 85mm thick. Ensure that the tank is installed on suitable base. The base must be sound, level, smooth, free of any protrusions and at least 100mm wider than the base of the tank (refer to pre-installation). Select desired pre-filtration options. Pre-filtration will differ depending on your preference and the intended use of the water. a. Ensure that the Tank Screen is fitted beneath the lid of the tank. b. Fit the leaf eater to the downpipe (vertically or horizontally). Install the First Flush Diverter as per instructions provided inside the packaging. Note: the first flush utilises a dependable ball & seal system, requiring no manual intervention. Install an additional elbow and pipe to the overflow, then route to a suitable desired area to ensure no water goes to waste.